Obesity is nowadays considered an epidemic disorder all around the world. Bariatric surgery is the only effective treatment for patients with morbid obesity; therefore the number of bariatric procedures has being increasing for years. The increase of obesity and bariatric surgery has provoked new ethical concerns that had never been seen before. The aim of this chapter was to discuss these ethical issues. First of all, ethical concerns related to obesity are discussed, such as excessive medicalization of obesity and importance of physical appearance. Discrimination associated with obesity and bariatric surgery is also an important issue. Then, ethical problems related to bariatric surgery are discussed. One of the most important issues is information and informed consent. Another important concern is access to bariatric surgery. Some patients cannot afford the surgery or have to use medical tourism in order to have this surgery performed. 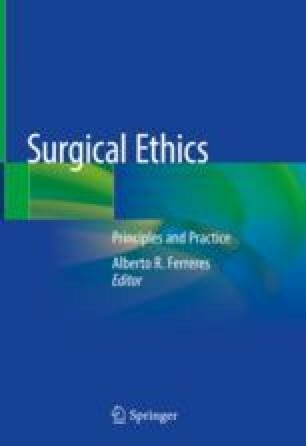 Bariatric surgery in children and teenagers is one of the most difficult ethics concerns that has been explained in this chapter. Others issues such as innovation, education, or body contouring surgery are also discussed. Peralta M, Ramos M, Lipert A, Martins J, Marques A. Prevalence and trends of overweight and obesity in older adults from 10 European countries from 2005 to 2013. Scand J Public Health. 2018. https://doi.org/10.1177/1403494818764810.